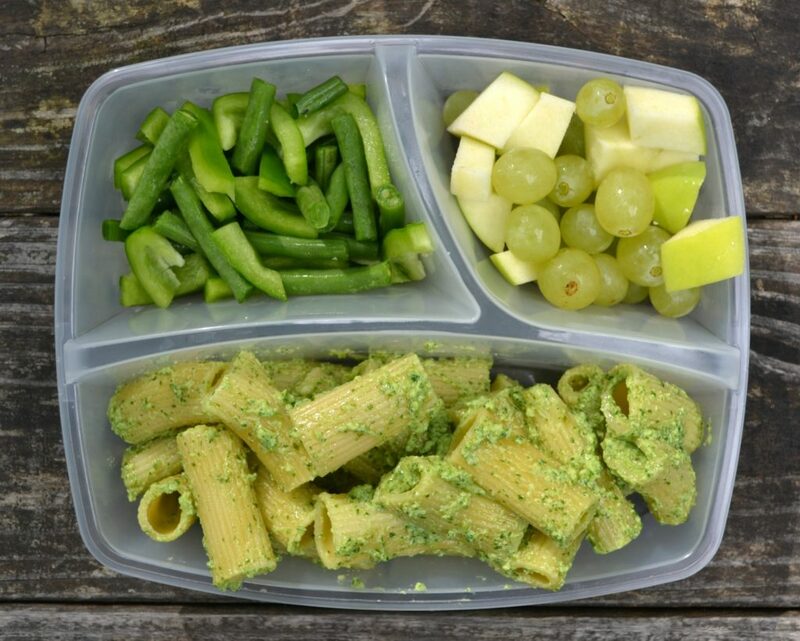 Monochromatic lunches focus on one color each day, making a simple lunch a little more fun and encouraging kids to try new fruits and vegetables! Quick – name a sure fire, never fail way to get your kid to eat food! Make it fun, of course! 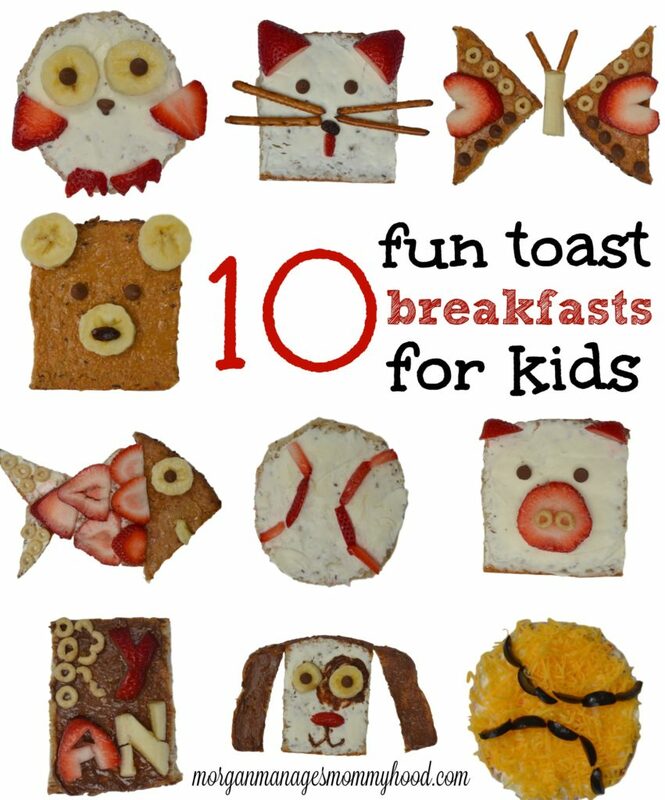 Over here, I love adding a little bit of whimsy to the boys’ meals. 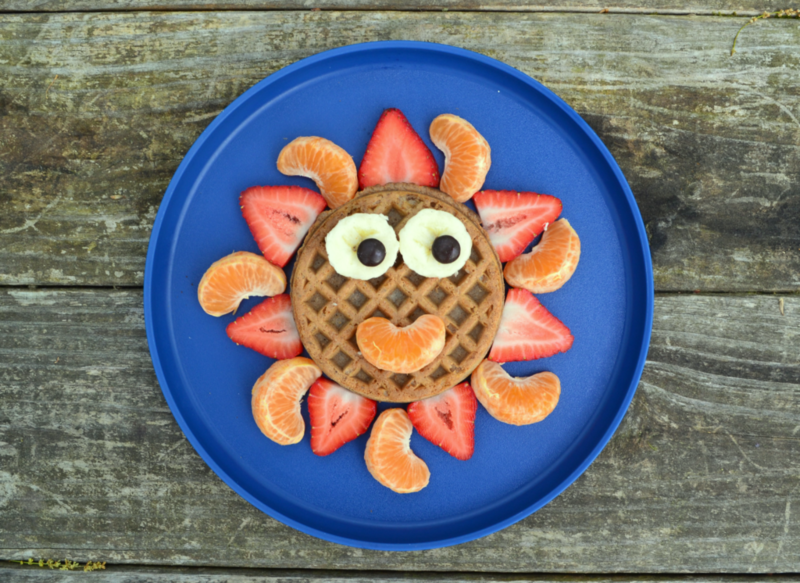 From turning bagels into fishbowls to serving up waffles that look like pigs, I think making fun kid food might be my favorite part of being a mom. (you know, besides the whole, “joy of raising good humans” thing. I dig that, too.) 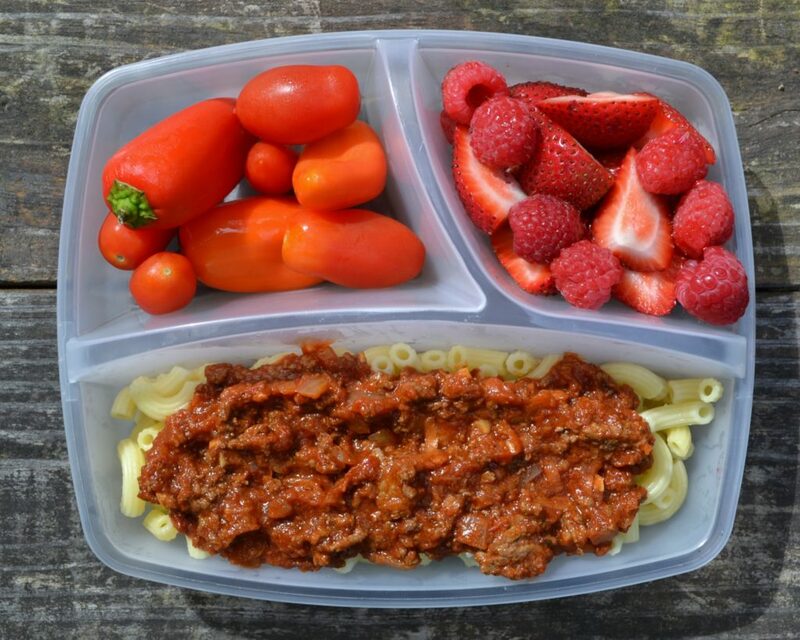 And while I like the chance to stretch my creative muscles and play with food, the number one reason I really make an effort to add some food to the boys’ meals is because anytime I put some thought into making their food fun, they eat a million times more – even if it’s ‘boring’ healthy food. A while ago I made Ryan lunch and he was beyond pleased that everything on his plate was red – his favorite color of the moment. So much so, in fact, that he ate about 90% of what was on his plate – even the raw bell peppers I had thrown on there in an effort to round out his meal and clean out the fridge. A light bulb went off and I went on my merry way planning to try a green lunch the following day. And what do you know, the kid ate the whole thing. Something as simple as just serving him everything in one color – no special decoration or cutters or anything like that – made him more engaged and invested in eating. It inspired conversation about his food (“Green peppers! Green apples! Green noodles!”) and took out a bit of the frustration of getting a 3-year-old to sit and eat a meal. 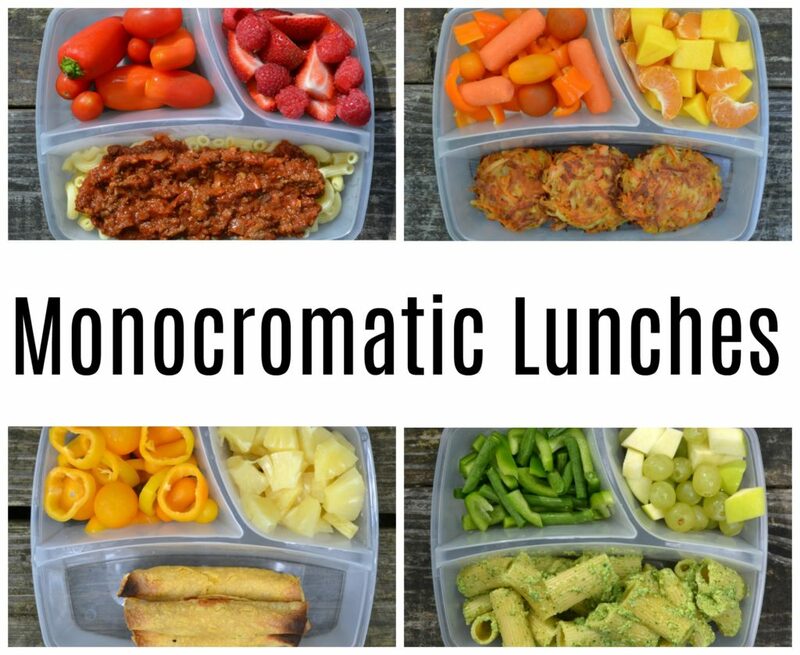 I know these monochromatic color lunches will definitely be in the rotation for Ryan this fall when he goes off to preschool! Want to try it out yourself? I documented a meal for each color below for you to get some inspiration from! Keep in mind, a lot of different fruits and vegetables can cross paths on the color wheel. A mango could probably go in an orange or a yellow box. 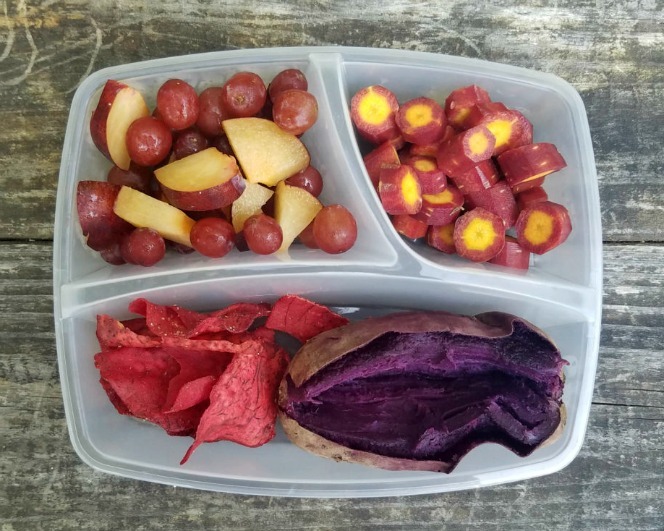 Most purple things could go into a pink or red lunch. Red and orange can sometimes cross over. Just go with whatever you want – this is supposed to be simple and fun! Main: elbow macaroni with RED Bolognese. I always make a big batch and keep some in the freezer for last minute meals. Tip: shred some carrot into the sauce when you’re making it – your kids will NEVER know and you’ll get some extra veggies in! Veggie: Carrots, orange tomato, and orange bell pepper. 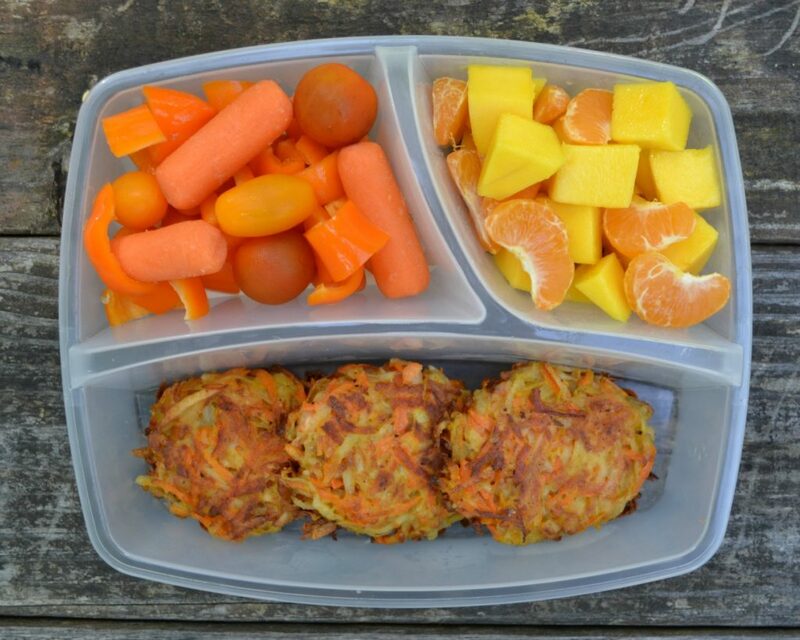 Main: Potato and carrot latkes. I shredded 3 potatoes, 5 carrots, and half of an onion before adding in 2 eggs, 2 TBS of flour, salt, pepper, paprika, and garlic powder. Add about 2-3 TBS into oil over medium heat until each side is golden. If you use sweet potato, you’ll obviously have more orange color, but I was out so I went with plain russet. 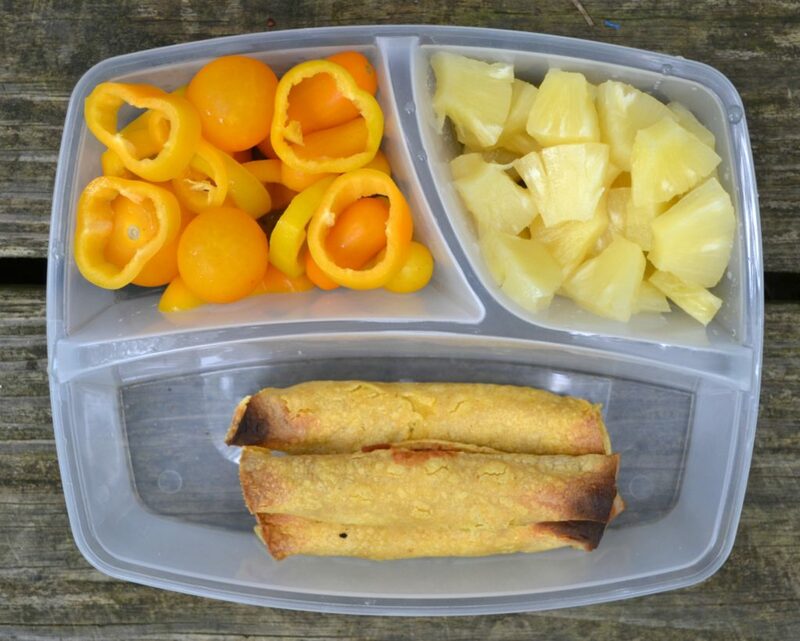 Main: Baked taquitos in corn tortillas. You can use frozen baked ones, but I just add refried beans and cheese to a corn tortilla, roll it up and bake. ** The only naturally blue food is blueberries (unless you add things like blue corn or blue cheese) so I stuck to just purple. I used raw fruits and vegetables – nothing too impressive – but my boys still gobbled it all up. I like to put a tablespoon or two of dressing at the bottom of the container before piling veggies on top as a dip. Also, feel free to try a cooked veggie! I think sauteed zoodles would be fun for green or maybe some sweet potato fries for orange. This is a really great example of how fun meals don’t really have to be a ton more work – something as simple as just sticking to one color brings a layer of fun that is unexpected. So tell me – would your kids like this? What main courses would you try out for each color? (asking for a friend.. ;)) Let me know in the comments! These are great! 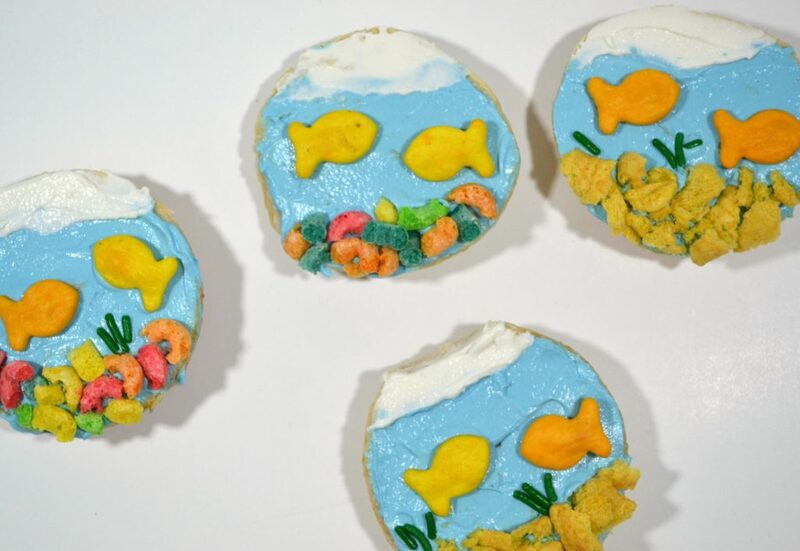 I really love all of the ways you make food fun for your kids, so creative, thanks for sharing!